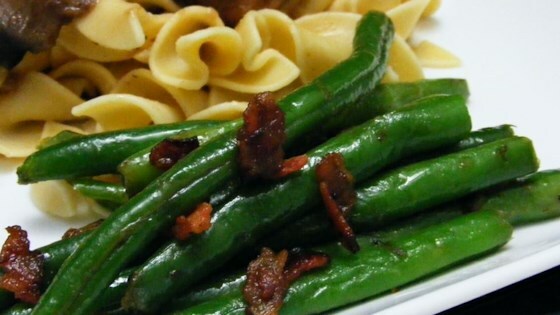 "Fresh green beans with sweet caramelized shallots and savory Italian pancetta take vegetables to a whole new level." Very good, but not great. I love this great simple recipe. I added a spash of Balsamic vinegar and 1 tsp of chopped garlic. the addition of pecans cooked with the shallots would be awesome. Very delicious side dish! I decided to use bacon instead of pancetta since I had it on hand. I used frozen green beans, let them thaw before cooking. I came out great! VERY VERY GOOD! Made for our small group and it was a HUGE HIT! Very easy and when you group the instructions together, ex: cook the bacon the same time as boiling the beans, it goes VERY quick.